The American Planning Association (APA) today announced that 5th and 6th avenues in downtown Portland is one of 10 Great Streets in America. 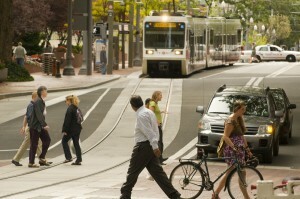 The designation is the result of the revitalization and renovation made along the Portland Transit Mall as part of the MAX Green Line extension. The designation covers the 57 blocks along the Portland Transit Mall between NW Irving and SW Jackson Street. In 2009, the Portland Mall Revitalization Project focused on renovating the Mall’s features into a more urban and dynamic environment. The project included adding light rail, updated bus stops, new shelter architecture, signage, seating, street furnishings and more public art, updating and transforming the Mall. The project improved the region’s transit core and enhanced vitality along the entire length of 5th and 6th avenues. 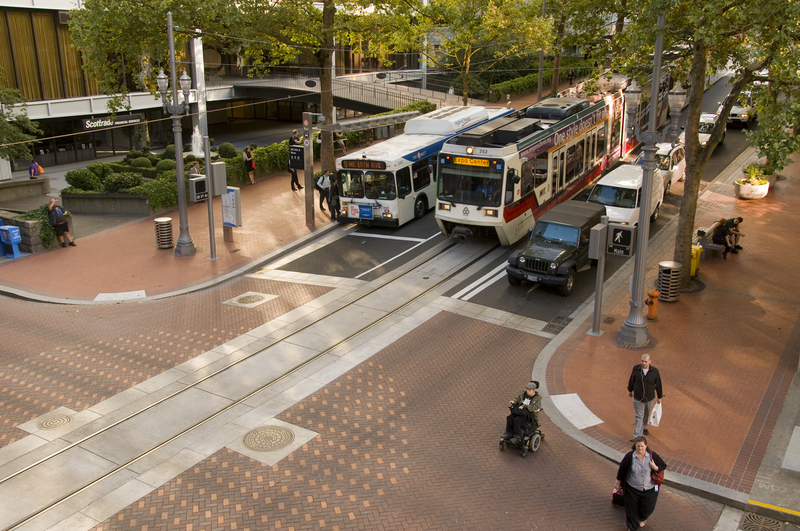 The idea for the original Portland Transit Mall was part of the City’s 1972 Downtown Plan to counter the loss of residents, investment and employment to the suburbs. The Plan was simple but firm in its vision – that downtown should not be re-configured to accommodate automobiles; parking should be restricted, transit should be enhanced and downtown should be a pleasant place to work, live, play, and visit. From this idea, a bold initiative emerged: conversion of the city’s prime commercial 5th and 6th avenues to a pedestrian and transit-oriented corridor. In 1994 the Mall was extended to Union Station and fully revitalized in 2009 as part of the Green Line. Portland Mayor Charlie Hales noted that the revitalized Mall continues to make downtown a great destination. The Mall has been improved with new storefronts and redevelopment, sustainable features and is managed by the Portland Mall Management, Inc. (PMMI) funded with both public and private funds.